© David Hockney. Photo of work by Andrew Fox. What distinguishes a fine contemporary artist from a master? One may find the answer at the extraordinary “David Hockney: A Bigger Exhibition.” Belying his age of 76, Hockney’s fabulous 398-piece show explores his brilliant talent, youthful enthusiasm, bountiful productivity and use of saturated color and enormous scale (hence the title of this show). At 18,000 square feet on two floors, it is the largest exhibit ever held at the de Young Museum. And the show covers only selected works from the David Hockney Foundation created between 1999 and September 2013. The de Young is fortunate to be the only venue for this survey. Hockney was born in Yorkshire, England, and studied at the Royal College of Art. He was first denied a diploma, as he had refused to write an essay required for the final examination, saying that his work was all that should be required. The Royal College relented, in recognition of his growing reputation and talent. Although Hockney was first connected with the British pop and abstract movements, most Americans associate him with his realistic, vividly colored acrylic series of California swimming pools and portraits of his gay friends and lovers that shocked the art world in the early 1960s. Hockney’s first love is drawing. Yet, at this exhibit, we see his command of 14 different media, including oil, watercolor, charcoal, crayon, ink, pencil, as well as laser and inkjet prints, video, and iPad, iPhone and digital drawings. Despite the variety of media, Hockney still favors flat landscapes and portraits. At every turn, we see another aspect of his creativity. One quarter of the exhibition is dedicated to recent portraits in pencil, watercolor, acrylic, oil, charcoal and Inkjet printed computer drawing on paper. I counted four portraits of Hockney’s painting assistant, Jean-Pierre Gonçalves de Lima, which were painted at different times to convey different emotions. Of special interest are the landscapes, which comprise one-third of the pieces shown. For example, Hockney painted many versions of each of the four seasons in Woldgate Woods, East Yorkshire. Each season is comprised of six canvases (each 36-by-48 inches). The 2006 Tunnel series uses the same technique. Hockney first completes the individual segments and then places them together. Adapting the newest technologies, Hockey presents a completely disparate version of Woldgate Woods using nine digital videos synchronized and presented on nine 55-inch screens, to comprise a single 81-by-143½-inch overall piece of art. 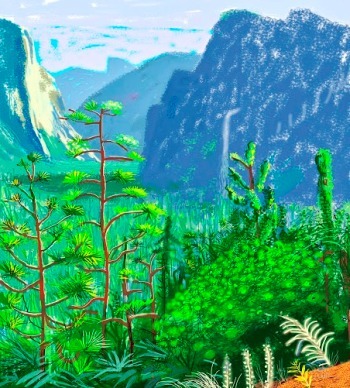 After finding his iPhone too small on which to draw by hand effectively, he was an early adopter of the iPad, as can be seen in Hockney’s iPad drawings of Yosemite in 2011. For example, each of the six sections of “Yosemite I” was first printed and then combined into one 143½-by-128¼-inch creation. At the press Q & A, Hockney’s eyes sparkled while describing his latest works. In response to a question, and after some thought, Hockney declared that his greatest influence was Picasso, largely because Picasso could draw—a talent that Hockney very much admires (and possesses). Further to his interest in representational drawing, Hockney was delighted with his digital film, in which one can watch him draw a still life with fruit. It’s viewed from a perspective that Hockney had never before seen. In keeping with the massive scale of this exhibition, the largest piece, “A Bigger Message, 2010,” an oil on 30 canvases (15-by-24 feet), is a standout. It grew out of the artist’s fascination with the perspective used by Claude Lorrain (French, 1600-1682) in his “Sermon of the Mount,” in which the large triangular shape encourages the viewer to look toward the mountaintop. In 2012, Hockney, worth an estimated $55.2 million, transferred paintings valued at $124.2 million to the David Hockney Foundation, and added an additional $1.2 million in cash to help fund the foundation’s administration. The artist plans that the foundation will give his work to museums including the Los Angeles County Museum of Art and the Tate in London. Perhaps he’ll be kind to the de Young Museum as well. Don’t miss this exhibit. You’ll be wowed by the monumental scope of Hockney’s creativity and talent.